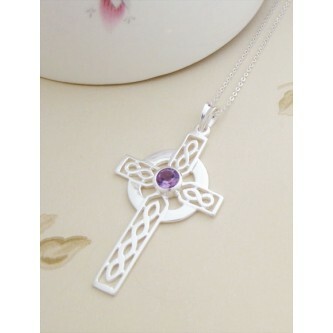 Lydia Celtic Cross in Amaethyst purple stone with a celtic design, a standout pendant! 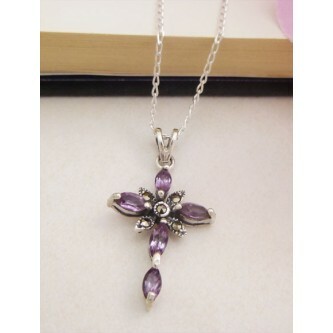 The Faith Amethyst Cross in stunning violet stones with a feminine feel, keep your Faith close to your heart! The Marlie Peridot Cross in olive green with a silver necklace chain, perfect for the August baby! The Guilty range of sterling silver necklaces with sterling silver cross pendants and ankh pendants with free delivery in the UK. View our great range of silver cross necklaces for those that want to feel close to god day and night. Our sterling silver cross necklaces for women are designed to offer great value, style and fashion whilst retaining their basic religious sentiment. From birthday, wedding and Christmas presents to Christian and religious ceremony presents, our sterling silver cross pendants and necklaces are designed to be stylish and meaningful. Guilty also stock sterling silver Ankh necklaces and pendants, the Ankh is the symbol of life with its origins in ancient Egypt and is also called the handled cross. Our Ankh silver necklaces for ladies are becoming increasingly popular as both a trend based silver necklace and also for those that appreciate the meaning and symbolism of the symbol of life, something that can be entirely personal to the wearer and a stunning personal gifts for a loved one. All of the Guilty range of sterling silver cross pendant necklaces and Ankh necklaces come with free UK delivery and bespoke padded necklace boxes.